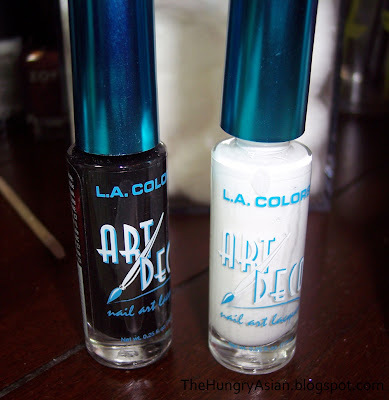 My weapons of choice: LA Colors Art Deco polish. I didn't think to take pictures during until I was working on my right hand, so it's not as good looking. I did an offset chevron so I paint a dot on the side and use that as my center guide. I'm wearing 2 streaky coats of Essie Glamour Do, I got a couple of Sinful Colors yesterday one was a sheer pink I should've used that! 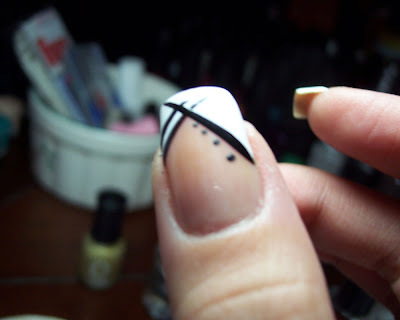 I used my white LA colors art polish it is a striper brush so super easy to draw the lines and fill in. 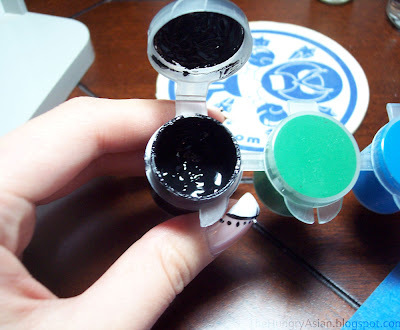 I forgot a step, but then I used my black art polish and made 2 brushstrokes going down, crisscrossing each other. Then I painted some dots on ring and thumbs using acrylic paint. Check out my super ghetto pack of paint lol it's all dried up I need to buy the big bottle soon! YES, that is a Strongbad coaster! We got free coasters with an order I made years ago lol. Also came with pink Homestar Runner ones, so cute! Okay so you draw your dot dot dot with acrylic paint, I also added an extra stripe on the dotted fingers. I missed a step again! I put 1 silver bullion on each nail after this. Looking at it now, the bullion was out of place and weird, oh well! 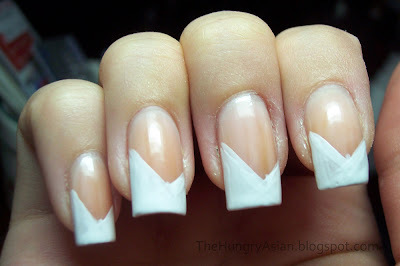 This is a gorgeous French manicure!! Love it! That's so pretty! I love this! 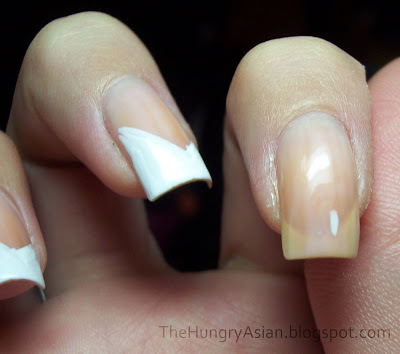 That is such a unique take on a French mani. I love it! I saw hers the other day, and it's just gorgeous! I could never do anything close to either of yours. I think yours is very beautiful and nice. I like the skinny black lines and dots. Thank you! Man I am such a broken record today lol. Thanks, I know you would do an awesome one! Aww thank you. Ooh another video I'll check it out later today! Just a gorgeous manicure. I love your designs. Your so neat and sweet! You should do mani like this more often, looks pretty on you ! You're so talented and I love your design!